Liang Shuo's art practice employs a variety of materials, from found objects, stones and plastic, to wood and clay, as just some examples from among many others. The diversity of material choices Liang Shuo creates for himself lies at the heart of an aesthetic system he terms "zha", which he takes to mean anything and everything. The use of "zha" lays particular emphasis upon the simple materials and objects to which he is drawn. 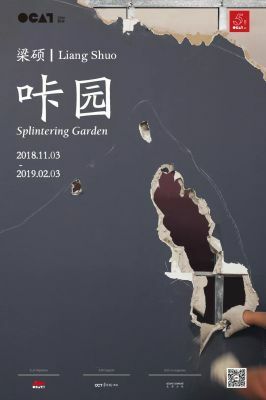 In this exhibition, Liang Shuo shows his most recent installation Splintering Garden in OCAT Xi'an. Visitors are invited to view this new garden, but as the name suggests, there is an air of fragility about it. This atmosphere is further enforced by the tantalizingly slender views of the larger garden that can be glimpsed either through cracks in the garden wall, or narrow spaces left between rocks and other obstructing forms Liang Shuo has created. If for no other reason than most don't exist longer than the span of exhibition. That makes the experiences of each almost more precious and memorable. Liang Shuo explains this by saying that he is interested in reminding us how natural landscapes that we are taught to recognize as high points of beauty in nature were formed. This being the result of a succession of natural disasters, catastrophes and elemental forces enacted upon them, like earthquakes, volcanic eruptions or changes in temperature, which made quick work of reshaping large swathes of the earth’s surface. Such force majeure has, through time, produced breath-taking landscape panoramas worldwide. The starting point for Splintering Garden was exactly this idea of breaking something to create something. Here, Liang Shuo shows how magical this paradox can be. Liang Shuo was born in Tianjin in 1976. He graduated from the Department of Sculpture at the Central Academy of Fine Arts, China (CAFA) in 2000, and taught as a professor in the Department of Sculpture at the Academy of Arts & Design of Tsinghua University, from 2002 to 2007. From 2005 to 2006, he was in artist residency at Royal Academy of Art, The Hague (KABK), the Netherlands. In 2009, he joined the Department of Sculpture at CAFA, where he remains a teacher. Liang currently lives and works in Beijing.